You now have the choice of purchasing our original units, and/or the choice to purchase a Dynamically Enhanced Units with all the magic of the synergistic properties they bring to the units. The line of Dynamically Enhanced Units have a flow-form inside that is the same structure and size as the flow-form in the original units, but is made from a combination of proprietary materials that dynamically enhance the energy of the unit and create a static energy that exists even before the water flowing through the unit is structured.Nothing physical is being deposited or physically added to the water. What is happening is that the structured water is being dynamically and energetically enhanced by the energy in the added materials. The Small Garden product is a convenient way to bring Structured Water™ to your plants and garden. Simply connect it to any faucet and hook up your hose. Garden products are easily connected to a recreational vehicle for filling water reservoirs while traveling. Great for use on hot tubs too! Extraordinary results are being obtained by watering plants with Structured Water™. Use it in your greenhouse or on an aqua phonics system. I have a farm and several greenhouses. What benefits might I experience by using a Small Garden product to grow my plants? Live plants LOVE Structured Water™! Some benefits include larger, healthier plants, plants that withstand more extreme temperatures, better hydration resulting in lower water requirements, higher nutrient levels, and plants that attract less insects due to superior health. I am purchasing a Small Garden product. What other ways can I utilize this product? The garden product can be used when traveling in your RV, to enjoy Structured Water™ on the road. Simply attach it to the water port on your RV or the water faucet from which you will getting water. The garden product can also be used in green houses, or with any other application where you will be connecting a garden hose. If I am watering my garden with a Structured Water™ Small Garden product, how far away will other plants be also benefited? The effects of Structured Water™ extend out to about 1,000 ft. Through entrainment, everything within 1,000 feet of the Structured Water™ will benefit from it's energy and be healthier. We invite you to browse through our store and shop with confidence. Your shopping cart will be active until you leave the store. 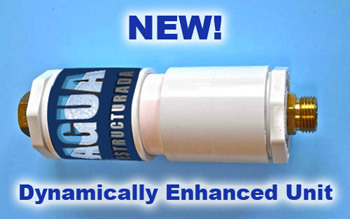 AguaEstructurada offers a MONEY BACK GUARANTEE ON ALL PRODUCTS if you are not 100 % satisfied with our products. You have 90 days to return your device without any risk. Hair & skin rinses are cleaner and hair feels better when washed. It improves health, less joint & muscle pain, more energy. Increased Potential Hydrogen (pH) 7.2-7.5 Balanced. Less soap is necessary when washing. Prevents dry itchy skin — no chlorine smell. Reduces odors around/in bathrooms & toilets. Clothes are washed and rinsed cleaner in the laundry. Removes existing calcium & aragonite deposits. Less fertilizer is required on gardens, house plants, crops and trees. Less algae growth in ponds & aquascapes. Don't have to buy bottled water. Don't have to replace cartridges. *These statements have not been evaluated by the Food and Drug Administration. This article, video and any product(s) associated with it is not intended to diagnose, treat, cure or prevent any disease. The content found on www.my-waterfilter.com from Arlis Hispania S.L., is for informational purposes only, and is in no way intended as medical advice, as a substitute for medical counseling, or as a treatment/cure for any disease or health condition and nor should it be construed as such because that would be illegal. Always work with a qualified health professional before making any changes to your diet, supplement use, prescription drug use, lifestyle, or exercise activities. Please understand that you assume all risks from the use, non-use, or misuse of this information. What is the Structured Water? Which is the difference between this water and the rest? Water is a chemical substance with the chemical formula H2O. Masaru Emoto: Are you drinking dead water? developer of the structured water unit.